The following examples are from Al Campbell's advanced fly tying articles. He talks about techniques used by Franz Pott, George Grant, Pete Sanchez, and Frederick J. Bridge. The added dimension that results from weaving is more realistic. For Potts most famous "Mite Series" sbs skip to Part 3. Thanks Norm for noticing my error and for the following correction. The sandy mite shown in link/part 3 is not a "woven HACKLE"
see the hair weaving process below the instructions for the "fizzle"
Addition: Feel free to comment on or share your experience with Woven Hackle or Woven Bodies. Thanks Norm for the video, Kimo for the pic, and Al for sharing your experience. I can see me weaving bodies but I will most likely stick with Marc Petitjean's magic tool for any hackle. Woven flies using the shuttle weave produce realistic flies as noted below. Here is my version of Aaron Jasper's Drone Stone pattern. 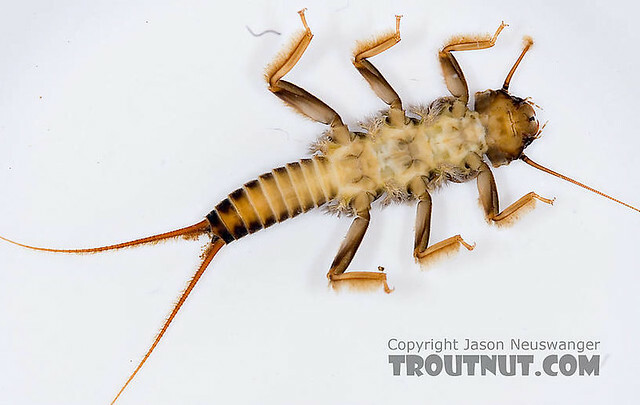 Here is a real stonefly nymph. It has a dark colored dorsal (posterior) surface and and a lighter ventral (anterior) surface. When a real nymph tumbles along the river bottom the trout see the alternating dark/light contrast. The Dronestone woven stonefly nymph imitates this dark/light contrast. The contrasting dark over light abdomen is a very realistic representation of the tumbling and drifting natural.. I have modified the tying instructions below from Aaron Jasper's original Drone Stone in the Autumn 2010 Fly Tyer magazine. 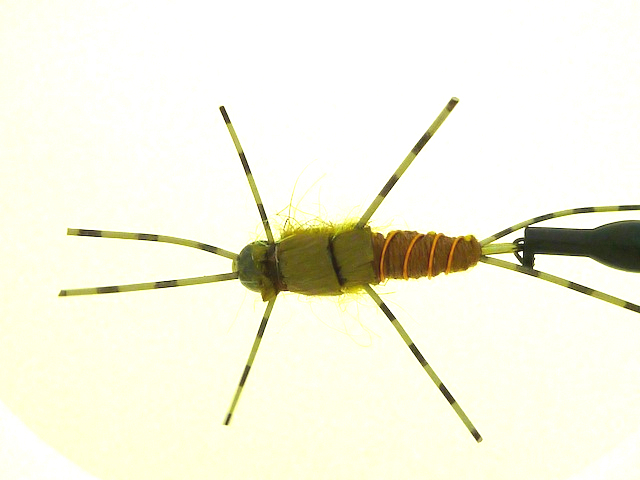 Unless you know how to weave, I suggest you first learn to weave simpler flies like a caddis larva in the YouTube video below. Take a look at this video and practice using embroidery floss. It is cheap and comes in all the colors you would ever want. Another tip is to use Uni Stretch Thread (this is a stretchable tying thread needed to cover the lead wire). This provides a smoother base and will make the following weaving step much easier. 1. Put bead on hook and clamp hook in vise. 2. Move bead to back of hook. Lay a thread base using Uni Stretch Thread (this is a stretchable tying thread needed to cover the lead wire) and move thread to the front and tie rubber antennae on behind the eye. Whip finish tread or tie two half hitches and cut off thread. Slide bead over the antennae butts. 3. Remount thread and tie in rear rubber tails. Then tie copper ribbing wire to the far side of the rubber tails. Keep thread to the rear. 4. Crimp lead wire to flatten and thin it and begin winding lead wire from rear to the front. Crimped lead forms a rear taper to the lead underbody. Depending on diameter of lead wire and hook size, a second row of lead may be needed to build up body. Make sure the lead under body maintains the tapered shape. Cover lead wire with Uni Stretch to form a smooth underbody. You may choose to do this step with dental floss or other floss if you don't have Uni Stretch tying thread. 5. Tie in the two colors of embroidery floss, on on each side of the body. Form a smooth underbody of Uni Stretch, tie off and cut off the thread. Weave the body to the bead, remount tying thread, wrap the ends of the embroidery floss, and cut off the floss. 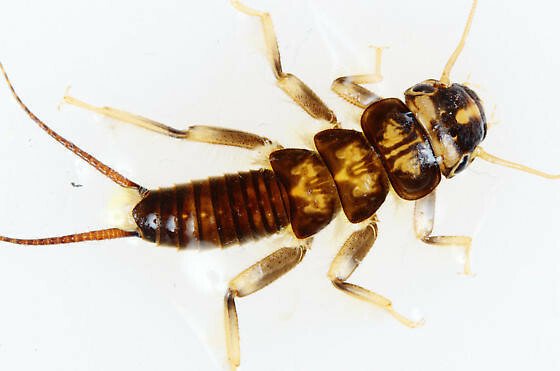 Although only half the weave will show, the rest provided the underlying bulk for the thorax. To learn the weave, take a look at this video by Aaron above and practice weaving using embroidery floss. It is cheap and comes in all the colors you would ever want. 6. Wind copper wire around the woven body, cut off and wrap end with tying thread. 8. Tie in the rear rubber legs on each side and tie them down rear to front along the sides up to the back of the bead. 9. Return thread to the back of the thorax and dub and wind forward about half of the thorax. Fold swiss straw forward over the dubbed section and tie down and go forward another few wraps. Fold swiss straw backwards over itself and tie down. Swiss Straw is now towards the rear of the hook again. 10. Dub and wind over the tied down section of swiss straw, and then dub forward to the back of the bead. Fold swiss straw forward to form the forward wing case. Tie down swiss straw with 2 thread wraps, cut off swiss straw and finish the tie off with a 5 turn whip finish. Instead of swiss straw, other wing case material such as turkey tail, or cut thin skin can be used. For me the swiss straw is faster. If you use other materials to form individual wing pads, the tying instructions change to accommodate the different construction method of tying down the pads over the dubbed thorax instead of folding the material to form pads with swiss straw. Like Bruce said, great fun to tie if you are looking for something different. Never found that woven flies perform any different however from similar unwoven patterns, so mostly just for show in my mind.